Let's talk about Smooth. Most scotch buyers want smooth. Most drinkers do not want to wince. Most drinkers don't want Islay Stank in their mouths the next morning. Most drinkers want a quiet but tasty libation. The cheap blends aren't smooth, and I know this because in a previous chapter of my life I consumed a high quantity of cheap blended scotch whisky. Many of the whiskies we geeky geeks geek about can be thunderous, trying, or even abusive experiences to most palates. Some folks don't want Penderecki's Threnody, they want a three-minute pop song. May I introduce, Chivas 18. Produced and engineered to be smooth, Chivas 18 is much cheaper than Johnnie Walker Blue Label (engineered for the same purpose). Hell, Costco has this thing on sale for $45 sometimes, so you can get three (or more) bottles for the price of one Blue. 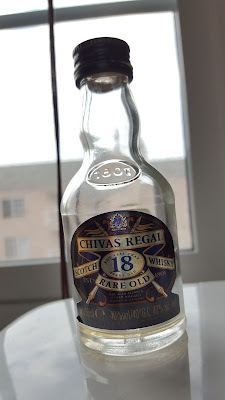 I will not declare that Chivas 18 is great nor profound whisky, but it tastes good, has some character to it, and has an actual finish. The last of which cannot be said of JW Blue Label. But as I cannot write a paragraph without including some complaint, I do mourn the quantities of 18 year old Longmorn, Glenlivet, and Strathisla being expended to create smooth. Its color is a red orange gold. Definitely redder than DiageoGold™. The nose is pretty straightforward at first. Sherry, vanilla, halvah, hazelnuts, and very distant fruits (melon and pear). There is a slight burnt note, but it vanishes after a couple minutese. After 20 minutes, notes of oranges and orange blossoms arrive. More raisins and prunes. In fact there's a good funky sherry note somewhere in the back; it's too bad it was watered down so. The palate is very easy, stress-free, steady, polished, frictionless. Lots of dried fruits and caramel sauce. A roasted/malty note in background. It's lightly tingly, but even that bite is comforting. It grows fruitier with time, think citrus and tropical stuff. The caramel remains prominent throughout. It finishes with the dried fruit, lychee, some flower blossoms. The slight burnt thing comes back for a moment: e150a? Finally, caramel candies and a subtle bitterness. 'Tis schmoove. The thesaurus has "velvety" and "creamy" as synonyms for "smooth" but, due to the level of filtering and added water, Chivas 18 never earns those adjectives. But it does have a dependable and enjoyable level of fruitiness and some pleasant sherry. While in its current state there's nearly zero complexity, I do think the potential is present for a really good whisky if it were (here it comes again) bottled at 46%abv, unfiltered, and uncolored. Instead what we have here is easy drinking. If you want more from your whisky, go elsewhere......to, say, Compass Box? Did you buy your bottle at Costco? It has a huge neck! The nice thing is, the cap doubles as a tumbler. Ken doesn't drink. How else would we expect him to maintain those excellent abs? This was Barbie's bottle.